The Squat is the KING of all exercises!!! 20 Reasons Why Squatting Is Awesome!! Not only do they build muscle and strength in the quadriceps, hamstrings and calves, they also create the ideal environment throughout the entire body. Naturally releasing testosterone and growth hormone, squats provide a highly anabolic environment for all other areas to grow when trained. If you want to increase muscle mass and strength in all areas, squatting will help you get there. Muscle burns fat. More muscle burns more fat. Being efficient at packing on muscle mass, the squat is a highly effective way to burn more fat. The more muscle you have on your frame, the more calories you will burn during training and at rest. If you want to get lean, stick to the big compound lifts namely the squat. Yes, the old school squat has finally been mentioned in the same breath as the uber-trendy term functionality. Once thought of as an exercise reserved for highly trained athletes and top-level bodybuilders, the squat has made its way from the depths of “moves to avoid” to being one of the most real-world applicable exercises of all. The squat can relate to a myriad of real-life activities helping to avoid injury and increasing efficiency in everyday life. By simply increasing overall lower body strength, squats help maintain mobility immensely. Furthermore, by performing squats in a full range of motion you can strengthen the leg muscles at all points enabling you to help prevent weaknesses and increase strength during other performance-related, mobile activities. This goes hand-in-hand with mobility. Creating more balance in turn will help facilitate more strength helping you to develop more muscle mass on those wheels. This also translates to other compound lifts as well such as deadlifts, bent-over barbell rows, push presses, clean and presses for upper body and help provide a foundation of balance and function for other lower body lifts such as lunges, single-leg squats and leg presses. Not only will squats put on appreciable amounts of size and strength on your legs, they will also increase performance by helping you jump higher and run faster. This is significant for those involved in sports either for the organized team player or weekend warrior. 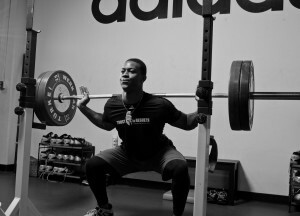 Squats serve to improve performance that covers a wide spectrum of sports (along with balance and mobility). They are truly the universal exercise. By strengthening an endless number of ancillary muscles of the lower body, hip and lumbar areas squats are extremely advantageous to preventing injury if done properly. The movement forces muscles to work synergistically and in unison for more stabilization and strengthening of weak points along the range of motion so the risk of injury is kept to a minimum. Squats actually help contract the core, namely the abdominal area, effectively and efficiently. Furthermore, studies have concluded these contractions are more intense than the traditional crunch. So, if you want stronger, tighter abs, be sure to squat. As stated earlier, squats have the ability, when done correctly, to strengthen joints and prevent injury. The hip, knee and ankle joints all work together to lift the load. This load is distributed across these selected joints for more strength and less stress on any one particular joint. The leg extension, for example, tends to put most of the sheer lifting stress on the knee increasing risk of injury. Not only are squats functional, they are also practical which can translate to many everyday tasks. Working outdoors, playing with your kids, playing a pickup game of basketball can all benefit from squatting.